1 Καὶ εἰσελθὼν διήρχετο τὴν Ἰεριχώ. 2 καὶ ἰδοὺ ἀνὴρ ὀνόματι καλούμενος Ζακχαῖος, καὶ αὐτὸς ἦν ἀρχιτελώνης καὶ αὐτὸς πλούσιος. 3 καὶ ἐζήτει ἰδεῖν τὸν Ἰησοῦν τίς ἐστιν, καὶ οὐκ ἠδύνατο ἀπὸ τοῦ ὄχλου ὅτι τῇ ἡλικίᾳ μικρὸς ἦν. 4 καὶ προδραμὼν εἰς τὸ ἔμπροσθεν ἀνέβη ἐπὶ συκομορέαν ἵνα ἴδῃ αὐτόν, ὅτι ἐκείνης ἤμελλεν διέρχεσθαι. 5 καὶ ὡς ἦλθεν ἐπὶ τὸν τόπον, ἀναβλέψας ὁ Ἰησοῦς εἶπεν πρὸς αὐτόν, Ζακχαῖε, σπεύσας κατάβηθι, σήμερον γὰρ ἐν τῷ οἴκῳ σου δεῖ με μεῖναι. 6 καὶ σπεύσας κατέβη, καὶ ὑπεδέξατο αὐτὸν χαίρων. 7 καὶ ἰδόντες πάντες διεγόγγυζον λέγοντες ὅτι Παρὰ ἁμαρτωλῷ ἀνδρὶ εἰσῆλθεν καταλῦσαι. 8 σταθεὶς δὲ Ζακχαῖος εἶπεν πρὸς τὸν κύριον, Ἰδοὺ τὰ ἡμίσιά μου τῶν ὑπαρχόντων, κύριε, τοῖς πτωχοῖς δίδωμι, καὶ εἴ τινός τι ἐσυκοφάντησα ἀποδίδωμι τετραπλοῦν. 9 εἶπεν δὲ πρὸς αὐτὸν ὁ Ἰησοῦς ὅτι Σήμερον σωτηρία τῷ οἴκῳ τούτῳ ἐγένετο, καθότι καὶ αὐτὸς υἱὸς Ἀβραάμ ἐστιν: 10 ἦλθεν γὰρ ὁ υἱὸς τοῦ ἀνθρώπου ζητῆσαι καὶ σῶσαι τὸ ἀπολωλός. Last week, we looked at the story of the Pharisee and the tax collector praying in the Temple (Luke 18: 9-14). Imagine if Zacchaeus was the model for that publican, that tax collector. The story of Zacchaeus (Luke 19: 1-10) is the Gospel reading for the Sunday after next, the Fourth Sunday before Advent (30 October 2016). It is a popular Sunday school story, and so, as with so many parables that are unique to Saint Luke’s Gospel, like the story of the Good Samaritan or the Prodigal Son, because it is so familiar to all of us, it is often difficult to read it again with fresh eyes and to find fresh insights. Yet, this is a fast-moving story, with all the fast-moving pace we are more familiar with in Saint Mark’s Gospel: every verse from verse 1 to 7, in the original Greek version of this story begins with the word καὶ (and), indicating that the pace has heightened, the story is speeding up, we are moving closer to the climax of this Gospel. Christ is about to set out from Jericho to Jerusalem. From Jericho, the road is going to be uphill more treacherous: remember that it is on this road between Jericho and Jerusalem that a certain man is mugged and left for dead until the Good Samaritan passes by (Luke 10: 25-37). Jericho was a major resting place or stopping point on a main trade route, at the centre of the lucrative trade in balsam, making it an important customs centre, and making it a lucrative and profitable location both for tax collectors and for bandits. But Jericho has other significance: the walls of Jericho fell down at the call of the trumpets (see Joshua 6). So in this reading, after Christ passes through the walls of Jericho, his call breaks down all the walls people erect around themselves, individually and collectively. Who is Zacchaeus? He cannot be Saint Matthew, who has already been called among the Twelve? Is he the tax collector in the previous Sunday’s Gospel reading? Certainly Zacchaeus is not any run-of-the-mill tax collector – he is the ἀρχιτελώνης (architelonis), the chief tax collector (verse 2), and so by contract had the right to collect revenues throughout this district. His name Zacchaeus (Greek Ζακχαῖος, Zakchaios) means pure, but his neighbours would have despised him, not only because they believed he squeezed the last drachma and the last lepta out of widows and children, but because they would also have seen him as a collaborator with the Roman administration – never mind that an autonomous Jewish government would still have had to raise taxes to provide itself with revenue and funding. His stature in some way symbolises his low place in Jewish society in Jericho. The tree Zacchaeus climbs (Greek συκάμινος, sikámeenos) is not the European sycamore but the sycamine tree, which has the shape and leaves of a mulberry tree but fruit that tastes like the fig, known also as the sycamore fig (συκόμορος, Ficus Sycomorus). 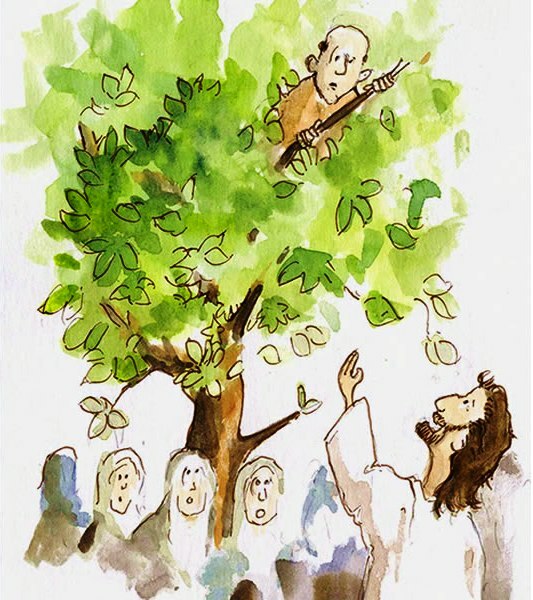 It is a big tree and little Zacchaeus the tax collector climbs it in order to see Christ (see verse 4). The sycamine tree is not naturally pollinated. The pollination process is initiated only when a wasp sticks its stinger right into the heart of the fruit. In other words, the tree and its fruit have to be stung in order to reproduce. There is a direct connection between suffering and growth, but also a lesson that everything in creation, including the wasp, has its place in the intricate balance of nature. So he can catch a glimpse of Christ, Zacchaeus climbs a sycamore tree (verse 4). Now while his name meant ‘pure,’ he climbed a tree that was regarded by some as unpure, unclean, for its fruit was fed to swine. This was humbling for Zacchaeus: to see Christ, Zacchaeus had to crucify his pride. And so the tree also symbolises the cross: a picture is being painted to allow us imagine Zacchaeus prefiguring those who take up his own cross and follow Christ (see Luke 9: 23), while Christ’s call to Zacchaeus to come down (verse 5) could also represent the call to humility for Christians. Zacchaeus is delighted and welcomes, receives Christ (verse 6). But when Christ goes to dine with Zacchaeus, all who saw it begin to grumble (verse 7): the people murmured in the wilderness; once again they are murmuring (διαγογγύζω, diagonguzo), complaining indignantly, when it comes to eating time, but this time they are not murmuring for food for themselves. Yet, in the wilderness God fed all the wandering people, whether they were sinners or righteous. Zacchaeus then stands before the Lord and says: ‘Look half of my possessions, Lord, I will give to the poor; and if I have defrauded anyone of anything, I will pay back four times as much’ (verse 8). Why does he not just pay back what he has taken? The Jewish legal code prescribes the restitution required when responsible for the loss of another’s property (see Exodus 22: 1-15). This restitution ranges from simple replacement for negligence, increasing up to two, four or five times replacement for various thefts. David applied this rule when he said: ‘he shall restore the lamb fourfold, because he did this thing, and because he had no pity’ (II Samuel 12: 6). Rather than asking how little he could do to correct his past wrongs, Zacchaeus chooses a generous restitution. He places himself on the guilty side of the spectrum in Exodus 22. Now he is living in maximum obedience to God. There is no law that says he must give half of everything to the poor, but Zacchaeus does this as well. We could compare this behaviour by Zacchaeus the tax-collector alongside the tax collector’s self-description with the Pharisee’s self-description and self-justification in the reading for the previous Sunday (Luke 18: 9-14, the Fifth Sunday before Advent, 23 October 2016). Zacchaeus also becomes a contrast of character with the Rich Young Ruler (Luke 18: 18-23), whose story comes between these two readings. Both Zacchaeus and the Rich Young Ruler are wealthy men, but one is self-righteous and will not give up his possessions, while the other gives half his possessions to feed the poor. But for me there are two other sharp comparisons provided in this story when Christ then says to Zacchaeus: ‘Today salvation has come to this house, because this too is a son of Abraham’ (verse 9). Who else is described in this Gospel as a ‘son of Abraham’ or ‘a daughter of Abraham’? Firstly, there is the unnamed rich man in the story of ‘Dives’ and Lazarus (Luke 16: 19-31), the Gospel reading for a Sunday last month [25 September 2016, the Eighteen Sunday after Trinity]. This rich man, and we do not know his name and we do not know whether or not he was a tax collector, addresses Abraham as ‘father’ or ‘Father Abraham,’ and he in turn, Christ tells us, is addressed by Abraham as ‘Child’ (verse 25). This morning we see very different behaviour from a rich man, who is hailed as a Child of Abraham, but for very different reasons, and unlike Dives, Zacchaeus is going to have a guest at his table. The woman who is bent over for 18 years and is healed in the synagogue (Luke 13: 10-17, see the Thirteenth Sunday after Trinity, 21 August 2016), is described by Christ as ‘a daughter of Abraham’ (Luke 13: 16). She too is an outsider, a marginalised person in her society, and because of her stature she has to be pushy in order to see Jesus, making her way through the men in the synagogue. The salvation that Christ brings is not specifically to the house in which Zacchaeus lives, nor even to the House of Israel, but to the household of God, especially those on the margins – those at the gates, those who are pushed outside when they cannot be pushy. The word οἶκος (oikos) in verse 9 means not just a house or even a specific inhabited house or home, but also refers to the house of God, the tabernacle, the place where God fixes his residence, the family of God, the household of the Christian Church, of the church of the Old Testament and New Testament. It is the stem word for ecumenism. Perhaps it is because the faith of Zacchaeus is so integral to the apostolic faith of the Church, and the salvation brought to his house is the salvation brought by Christ into the whole world, that the early Church developed a number of traditions around Zacchaeus. Saint Clement of Rome tells us that Zacchaeus became a companion of the Apostle Peter. Together they preached in Rome, and there during Nero’s reign Zacchaeus accepted a martyr’s death. On the other hand, according to Clement of Alexandria, in Stromata, and in the tradition of the Eastern Church, Zacchaeus was surnamed Matthias by the apostles, and he took the place of Judas among the Twelve after the Ascension (Acts 1: 26). The Apostolic Constitutions (7: 46) identify ‘Zacchaeus the Publican’ as the first bishop of Caesarea. (Revd Canon Professor) Patrick Comerford is Lecturer in Anglicanism, Liturgy and Church History, the Church of Ireland Theological Institute. This essay is based on notes prepared for a Bible study in a tutorial group with MTh students on 19 October 2016. During my rambles through Carlow on Saturday afternoon [15 October 2016], I visited Carlow Castle, now standing ruins near the east bank of the River Barrow. As a strategic river crossing, Carlow was the scene of a number of important battles and the Anglo Normans recognised its importance when the river was first fortified in the 1180s by Hugh de Lacy followed by building the great Carlow Castle in the early 13th century. Carlow Castle is thought to be have been built by William de Marshal, Earl of Pembroke and Lord of Leinster, between 1207 and 1213. At the time, the site of the castle was a small island on the River Barrow. It was a French-style keep with four towers. The design is rare for a castle in Ireland and it may have been copied from western France, then also under Norman control. The castle was the very first of its kind in Ireland, a towered keep, with a huge rectangular tower was surrounded by four smaller three-quarter-circular towers at the corners of the rectangle. Originally it was a rectangular block, containing the castle’s principle rooms protected by cylindrical towers at its corners. Historians and archaeologists today doubt that Carlow Castle supported the traditional function of a keep, serving as a refuge of last resort. Instead, it deliberately diverted from the contemporary standard in England and continental Europe. For example, there was no towered curtain, no gate house, and no undivided great hall. Similar castles of the same period were erected in both Ferns and Terryglass. The inner castle measured 16 by 9.2 metres (52 ft × 30 ft), the towers were15 feet (4.6 m) in diameter, and the walls were 9 feet (2.7 m) thick. The inner castle had three storeys and timber was used for the upper storeys. The long west wall provided stairways and two latrines. The latrines indicate that the space was divided. The entrance door was in the first floor, but this is now broken out. When William Matrshall died in 1219, his estate was divided between his five daughters. The His eldest daughter Maud inherited the Lordship of Carlow, comprising of all of present-day Co Carlow, along with much of Co Wexford, large parts of Co Laois and the manor of Ballysax in Co Kildare. The title of Earl Marshal and the ownership of Carlow Castle passed to Maud’s eldest son, Roger Bigod, 4th Earl of Norfolk. Between 1283 and 1292, the 5th Earl of Norfolk began an extensive restoration of Carlow Castle. Some 12,000 wooden shingles were shipped up the Barrow from Dunleckney woods to cover the roof of the Great Hall. Both floors of the tower containing the Exchequer House were refurbished with 130 timber boards from Tullow. The treasurer’s office and court were at ground level, while the wooden chests of money and records were kept upstairs. The kitchen and castle prison were rebuilt too. The castle was handed over to the crown in 1306, and in 1312 it was granted to Thomas Plantagenet. During the 14th century, Carlow grew in importance. In 1361, King Edward III’s son, Prince Lionel, Duke of Clarence, moved the main organs of government from Dublin to Carlow, including the King’s Bench and the Court of Exchequer. The plan was to give the English control of the River Barrow, one of Ireland’s great highways, and enable them to strike at the ‘king’s Irish enemies,’ including the O’Mores, the O’Connors and other families, and for over three decades Carlow was effectively the capital of Ireland. But Carlow stood on the edge of the Pale, and it was a prime target for attacks. Eventually, the King’s Bench and the Court of Exchequer were moved back to Dublin in 1394. In the centuries that followed, there were numerous attacks on the castle, including attacks led by Art MacMurrough Kavanagh (1405), Silken Thomas (1534) and Rory Oge O’Moore (1577). However, none of those attacks inflicted anything more than a dent in the castle with walls that were 9 ft wide walls and towers rising to over 60 ft.
Carlow Castle was confiscated by the crown in 1537 because the Earls of Norfolk were absent. James Butler, son of the Earl of Ormond, was appointed Constable of Carlow Castle, and the Butlers would retain the lease of the castle through the rest of the Tudor age until the Earls of Thomond succeeded them in 1604. The Earls of Thomond held onto Carlow Castle until the Confederate Wars, when it was attacked by Sir Morgan Kavanagh (1641) and then by General Thomas Preston (1647). The castle was confiscated by the Confederates, but it was captured in 1650 by Cromwell’s Deputy and son-in-law, General Henry Ireton, who released 500 prisoners held captive there. It passed back to the Earl of Thomond, and following the Restoration in 1660, Henry O’Brien, 7th Earl of Thomond, was confirmed in his possession of Carlow Castle. In 1719, Thomond appointed a Dublin lawyer, James Hamilton, to serve as chief steward of his Irish estates, including Carlow. The 8th and last Earl of Thomond died in 1741 and his Irish estates passed to his nephew by marriage, Percy Wyndham, who adopted the name O’Brien. James Hamilton died in 1771 and was succeeded by his eldest son Hans Hamilton, who was MP for Co Dublin for 30 years. The Hamilton family’s title to the land and Carlow Castle was later confirmed and Carlow Castle was still standing and was largely intact in 1813 when the Hamilton family leased it to Phillip Parry Price Middleton, and English doctor. Dr Middleton invested £2,000 in rebuilding and remodelling of the castle in an attempt to convert it into a private Maison de Santé or ‘lunatic asylum.’ During his renovations, Middleton believed he could gain valuable extra space by building tunnels under the castle and reducing the thickness of the walls by using blasting powder. But the results were not as he planned. He placed explosive charges at the base of the castle on Sunday 13 February 1814, and then demolished all but the western wall and two towers. The castle area was excavated for the first time ever in 1996 by a team of archaeologists under the direction of Dr Kieran O’Conor of the Office of Public Works. He published a summary of his findings in the 1997 Autumn edition of the journal Archaeology Ireland. Today, two battered towers and the outer face of the west wall are all that remain of Carlow Castle today. Despite this, the castle remains one of the most prominent features on the River Barrow and it is designated a National Monument.